Stephen Gogolev performs his Short Program at the 2019 Canadian Tire National Figure Skating Championships. Patrick Chan, who won ten national titles in eleven years from 2008 to 2018, retired at the end of the 2017-2018 season, leaving the throne vacant. The game to sit in said throne began on Friday in Saint John, as Canada’s top senior men competed in the short program at the 2019 Canadian Tire National Skating Championships. In first place after the short program is 14-year-old Stephen Gogolev. The skater is coming off a blockbuster fall season that began with a world record-setting victory at the Junior Grand Prix event in Bratislava, Slovakia, and concluded by exceeding that world record and becoming the first Canadian to win the Junior Grand Prix Final men’s event. However, he had a disappointing fifth-place finish at the Junior Grand Prix in Vancouver. Competing as a senior domestically, Gogolev began his program with a flawless quadruple Salchow-triple toe loop combination, and followed that up with a triple Lutz and a pristine triple Axel in the second half of his program. The skater also earned level 4 on his step sequence and all spin elements, for a total score of 88.77. Characteristically modest afterward, Gogolev said he was excited for the long program: “I’ll try to do my best.” He identified the quad Salchow as his favorite jump. He competed domestically as a senior in 2018 as well, finishing 10th last year, but said he felt more comfortable this time around. Just behind Gogolev with a score of 87.18 was Keegan Messing, the 2018 national silver medalist who has been making a name for himself in the last year with strong performances at the World Championships, the Nebelhorn Trophy, and Skate Canada International, as well as qualifying as an alternate to the Grand Prix Final. Messing’s short program began with his one error, as the normally reliable quadruple toe loop went badly awry. Despite his opening error, Messing went on to land a triple Axel and a triple Lutz-triple toe loop combination. In saving the combination that had been planned for his opening jump, he omitted the split jump entry into the Lutz to facilitate adding the triple toe loop, a modification introduced after a similar situation at the Rostelecom Cup. He received two level 4s and one level 3 on his spins, and a level 3 on his step sequence. Nam Nguyen sits in third place with a score of 85.73. The 20-year-old opened his program with an attempt at a quadruple Salchow-triple toe loop combination, but admitted he “felt a bit tight,” and turned the triple into a double. However, he was able “to relax after and enjoy with the audience.” Nguyen’s triple Axel and triple flip attempts went smoothly, and he earned a level 4 step sequence and one level 4 spin, with his other spins being level 3. In fourth place after the short was Conrad Orzel, who skated a clean program leading off with a quadruple toe loop, followed by a triple Lutz-triple toe loop combination and a triple Axel. The 18-year-old earned only a level 2 on his first spin, but a level 3 on his step sequence and level 4s on his remaining two spins to conclude the program. He was awarded a score of 82.87 from the the judges. Orzel began the season by making a move to the Toronto Cricket, Skating & Curling Club, where he is now coached, as is Gogolev, by Lee Barkell, whose guidance Orzel praised. He had suffered a major disappointment after missing the podium at the Junior Grand Prix event in Slovenia by 0.01 points. Roman Sadovsky is currently in fifth place, but scored 82.10 despite singling an attempted quadruple toe loop, thanks to a strong quadruple Salchow-triple toe loop and a triple Axel in the bonus period of the program. 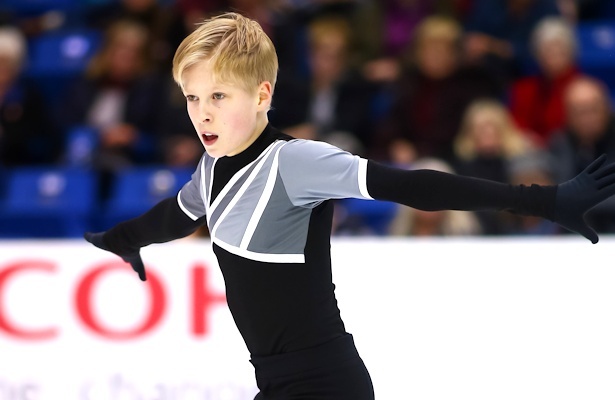 The skater, who medaled at both challenger events this season, also earned level 4s on all of his spins and his step sequence. Rounding out the final flight for the free skate was Joseph Phan, who trains alongside Gogolev and Orzel at the TCC, and like Orzel, made the move there over the preceding summer. Phan, like Messing, opened his program with a fall on a quadruple toe loop attempt, and successfully added a triple toe loop onto his planned concluding triple Lutz, albeit with a brush with the arena boards in the process. He earned three level 4s on his spins, and a level 3 on his step sequence, but also received an insufficient rotation call on the Change Combination Spin. His score was 76.35. Phan was pleased that after the opening error, he was able to execute his backup plan for the combination. Speaking of his move to the TCC, he said, “to be honest, I found it a bit overwhelming at first, but at the same time I found it exciting, because now I can train with my rivals. It’s a friendly rivalry.” Looking ahead, he said his goal was to give his all, and hopefully return to the World Junior Figure Skating Championships, where he placed fourth last year.